Exchange store ‘<storage group name>\<database name>’: The logical size of this database (the logical size equals the physical size of the .edb file minus the logical free space) is 94 GB. This database size is approaching the size limit of 100 GB. If the logical database size exceeds the maximum size limit, it will be dismounted on a regular basis. 3. 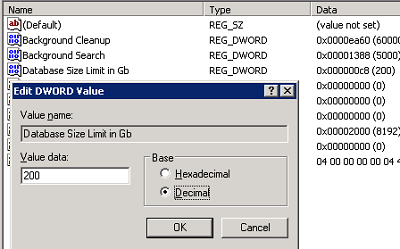 If the DWORD key “Database Size Limit in Gb” exists, change the value to desired size in GB.4. If the DWORD key “Database Size Limit in Gb” does not exists, create a new DWORD key with the name Database Size Limit in Gb and change the value to desired size in GB. 4. Restart the Exchange Information Store service. To display mailbox size in Exchange 2007 run this command in Exchange Management Shell. To pipe the output into a text file. When you have a user account disabled in Active Directory the users mailbox still receives e-mail. To end this behavior you need to delete the user account in Active Directory (this also deletes the mailbox) or disabling the mailbox in Exchange Management Console. Disabling the mailbox in EMC actually deletes the mailbox.